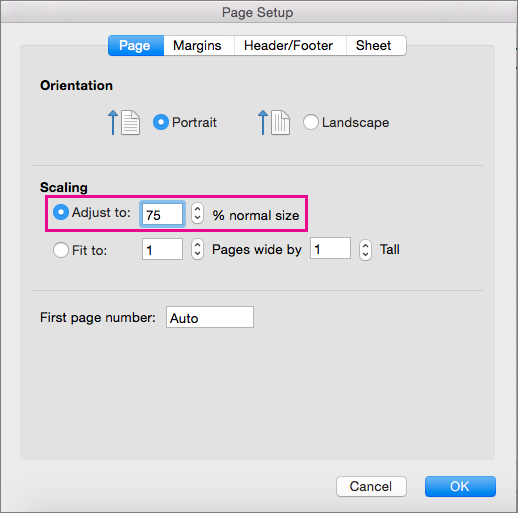 You can reduce or enlarge the sheet size for printing to fit the page width, or on a specified number of pages. On the Page Layout tab, select Page Setup. On the Page tab, select the Fit To check box. In the Page wide by box, enter 1 (for one-page wide). In the Tall box, enter 0 so that the number of pages tall is unspecified. Note: Excel ignores manual page breaks when you use the Fit To option. In the Pages wide by and Tall boxes, enter the number of pages on which you want to print the sheet. On the Page tab, select the Adjust to check box, and select the percentage to reduce or enlarge the sheet. Note: Printed data never exceeds 100%. On the Layout tab, under Print, select the Fit To check box. In the page(s) wide box, enter 1 (for one-page wide). In the page(s) tall box, enter 0 so that the number of pages tall is unspecified. 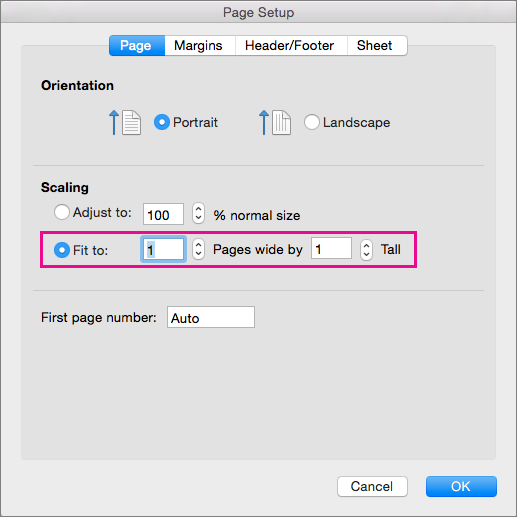 In the page(s) wide and page(s) tall boxes, enter the number of pages on which you want to print the sheet. On the Layout tab, under Print, in the Scale box, enter the percentage to reduce or enlarge the sheet.